It is preferable when dealing with large amounts of memory to use physically contiguous pages in memory both for cache related and memory access latency reasons. Unfortunately, due to external fragmentation problems with the buddy allocator, this is not always possible. Linux provides a mechanism via vmalloc() where non-contiguous physically memory can be used that is contiguous in virtual memory. An area is reserved in the virtual address space between VMALLOC_START and VMALLOC_END. The location of VMALLOC_START depends on the amount of available physical memory but the region will always be at least VMALLOC_RESERVE in size, which on the x86 is 128MiB. The exact size of the region is discussed in Section 4.1. The page tables in this region are adjusted as necessary to point to physical pages which are allocated with the normal physical page allocator. This means that allocation must be a multiple of the hardware page size. 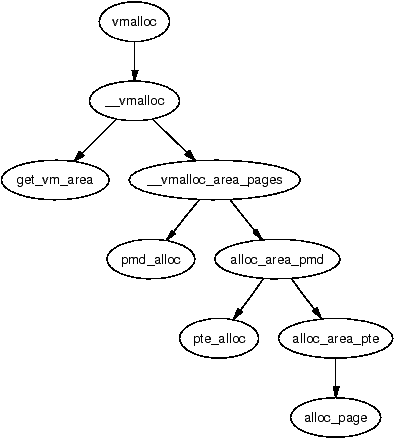 As allocations require altering the kernel page tables, there is a limitation on how much memory can be mapped with vmalloc() as only the virtual addresses space between VMALLOC_START and VMALLOC_END is available. As a result, it is used sparingly in the core kernel. In 2.4.22, it is only used for storing the swap map information (see Chapter 11) and for loading kernel modules into memory. This small chapter begins with a description of how the kernel tracks which areas in the vmalloc address space are used and how regions are allocated and freed. A fully-fledged VMA could have been used but it contains extra information that does not apply to vmalloc areas and would be wasteful. Here is a brief description of the fields in this small struct. next is a pointer to the next vm_struct. They are ordered by address and the list is protected by the vmlist_lock lock. As is clear, the areas are linked together via the next field and are ordered by address for simple searches. Each area is separated by at least one page to protect against overruns. This is illustrated by the gaps in Figure 7.1. When the kernel wishes to allocate a new area, the vm_struct list is searched linearly by the function get_vm_area(). Space for the struct is allocated with kmalloc(). When the virtual area is used for remapping an area for IO (commonly referred to as ioremapping), this function will be called directly to map the requested area. The functions vmalloc(), vmalloc_dma() and vmalloc_32() are provided to allocate a memory area that is contiguous in virtual address space. They all take a single parameter size which is rounded up to the next page alignment. They all return a linear address for the new allocated area. As is clear from the call graph shown in Figure 7.2, there are two steps to allocating the area. The first step taken by get_vm_area() is to find a region large enough to store the request. It searches through a linear linked list of vm_structs and returns a new struct describing the allocated region. The second step is to allocate the necessary PGD entries with vmalloc_area_pages(), PMD entries with alloc_area_pmd() and PTE entries with alloc_area_pte() before finally allocating the page with alloc_page(). The page table updated by vmalloc() is not the current process but the reference page table stored at init_mm→pgd. This means that a process accessing the vmalloc area will cause a page fault exception as its page tables are not pointing to the correct area. There is a special case in the page fault handling code which knows that the fault occured in the vmalloc area and updates the current process page tables using information from the master page table. How the use of vmalloc() relates to the buddy allocator and page faulting is illustrated in Figure 7.3. 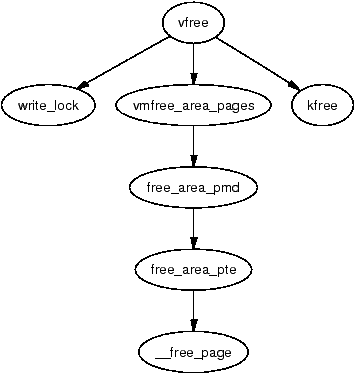 The function vfree() is responsible for freeing a virtual area. It linearly searches the list of vm_structs looking for the desired region and then calls vmfree_area_pages() on the region of memory to be freed. ` vmfree_area_pages() is the exact opposite of vmalloc_area_pages(). It walks the page tables freeing up the page table entries and associated pages for the region. Non-contiguous memory allocation remains essentially the same in 2.6. The main difference is a slightly different internal API which affects when the pages are allocated. 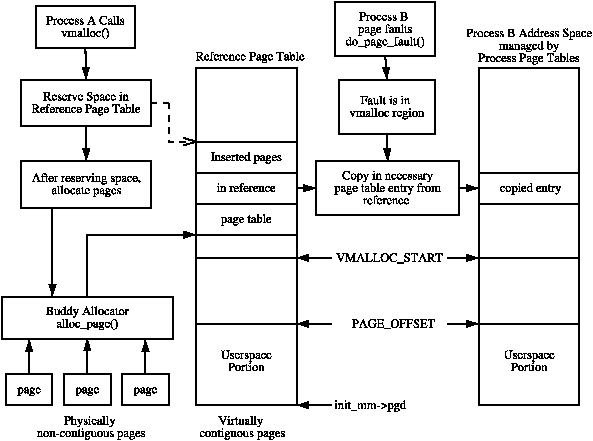 In 2.4, vmalloc_area_pages() is responsible for beginning a page table walk and then allocating pages when the PTE is reached in the function alloc_area_pte(). In 2.6, all the pages are allocated in advance by __vmalloc() and placed in an array which is passed to map_vm_area() for insertion into the kernel page tables. The get_vm_area() API has changed very slightly. When called, it behaves the same as previously as it searches the entire vmalloc virtual address space for a free area. However, a caller can search just a subset of the vmalloc address space by calling __get_vm_area() directly and specifying the range. This is only used by the ARM architecture when loading modules. The last significant change is the introduction of a new interface vmap() for the insertion of an array of pages in the vmalloc address space and is only used by the sound subsystem core. This interface was backported to 2.4.22 but it is totally unused. It is either the result of an accidental backport or was merged to ease the application of vendor-specific patches that require vmap().